As with most things, computing is subject to the whims of fashion. It isn’t always a negative force either, as anyone who remembers the days where PCs only came in beige will attest. We bring this up because we’re slightly on the fence about one of the current trends in computing - mechanical gaming keyboards. Yes they’re technically better to type on and use, but their traditionally exorbitant cost (compared to membrane keyboards) has made them difficult to recommend to everyone. Times are-a-changing however, and the cost of entering the world of mechanical keyboards seems to be tumbling all the time. The distinctive looking and Premium Grade winning Corsair K60 - which cleverly uses a combination of membrane and mechanical keys to keep costs down - can now be had for under £90, and the Ozone Strike we’re looking at today retails for £78, which is comparable to top end membrane keyboards like the Logitech G510. Naturally the Strike is light on features compared to a top end membrane board (pretty much all you’ve got to play with is a pair of USB 2 ports and audio pass through capability) but Ozone is clearly hoping that the allure of the Cherry Black keys under each key-cap of the Strike will make it an attractive proposition. 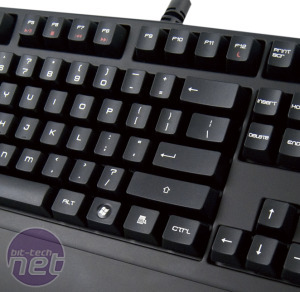 It’s a safe bet too as, like the other Cherry Black keyboards we’ve tested, the Strike is a pleasure to type on thanks to the long, linear travel of the keys and the pleasant 60g actuation force. 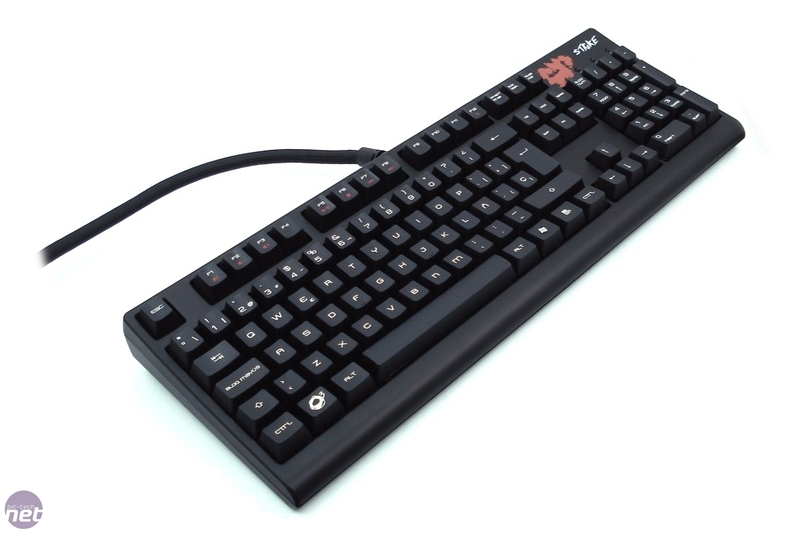 Interestingly the similarly priced Corsair K60 uses red, rather than black switches, as these have a lower actuation force, meaning (according to Corsair) that they can be pressed quicker, making them better for gaming. As a team, we’re not sure if we buy into this, as some of us prefer the lighter touch of red switches, and some the more traditional feeling of black switches. What we’re saying here (in a roundabout way) is that switch preference is a personal thing, so it’s not an immediate black mark that the Strike uses different switches to the K60. 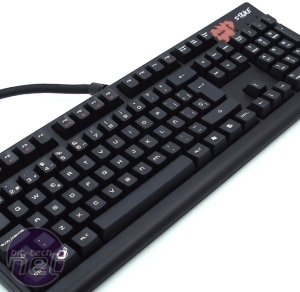 One specification where the Strike does clearly exceed the K60 is that it uses mechanical switches for all its keys, rather than just the main letter keys and the number pad. Whether or not this is a big deal will come down to how you use your keyboard, but we’d wager that most people would find the dedicated media keys and volume control of the K60 more useful day-to-day. The Strike does have media controls, mind, but they’re only secondary functions of the F-keys, rather than dedicated controls. The Strike is very comfortable in use, and the large wrist rest means our wrists attacked the keyboard at just the right angle. The benefit of this shouldn’t be underestimated for long typing sessions, and it’s something that is sorely lacking from the K60. You’ll perhaps be a little less happy using the Strike in the dark, as it’d keys aren’t back lit. Given how difficult (and costly) backlighting is to achieve on a mechanical keyboard though, we’re not surprised at this omission. 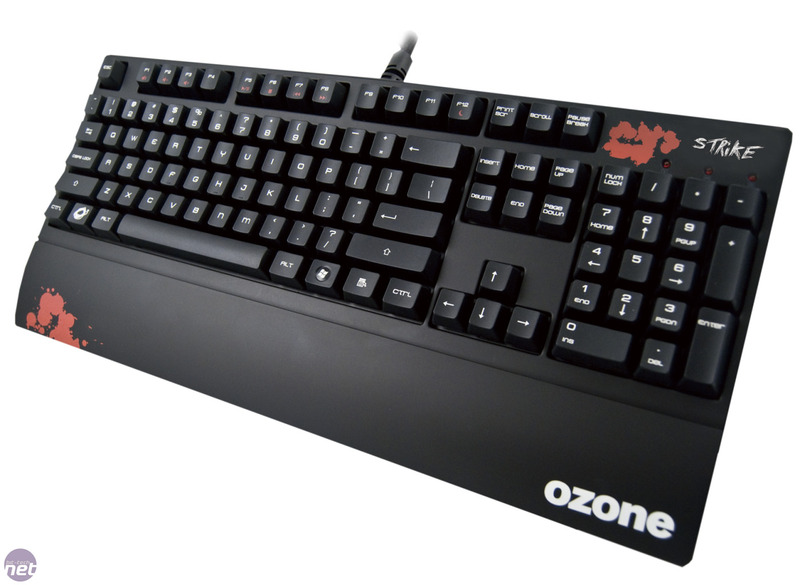 There is no doubting that the Ozone Strike is a competent mechanical keyboard, and it’s well priced too, meaning it’s an attractive option if you’ve not got oodles to spend but still want a mechanical board. If it were our money however, we’d be looking at the marginally more expensive Corsair K60 over the Strike, as it’s exposed aluminium chassis and media keys just make it that little bit more special. That may sound trivial to some, but if we were dropping £80 on a keyboard, we’d certainly want something that felt special rather than merely competent.